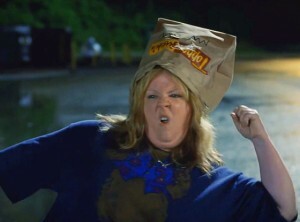 Melissa McCarthy (Bridesmaids) hits the road (we haven’t heard how the road is faring from the assault…) in the 2014 comedy Tammy. After losing her job, husband and car in one day, Tammy Banks (McCarthy) wants out of her small town existence. With no money or transportation, her only way out is with her hard-partying grandmother, Pearl (Susan Sarandon, The Greatest). Their misadventures and brushes with the law lead them on a funny and heartfelt road trip to remember. A road trip to remember? Well, audiences committed the trip to their memory via a not-bad $85 million at the domestic box office. But critics tried to put the trip out of their heads, slamming it with a 4.1/10 rating at Rotten Tomatoes based on 153 published reviews.